Our CPR/AED certification for healthcare professionals follow the latest American Heart Association and ECC/ILCOR guidelines and are nationally accepted. The course is designed for first-time participants as well as people who are renewing their CPR/AED certification. You always have an option to take the exam once you have reviewed the course. This course teaches latest CPR/AED techniques to address the most common situations that can happen in the healthcare setting. This course is designed to train you to respond to emergencies. You will also learn essential life-saving techniques to feel confident in situations where immediate action can make all the difference. The course is developed by U.S. board certified physicians. CPR and Types of CPR: This section defines CPR and how Infant, Child and Adult CPR are different. 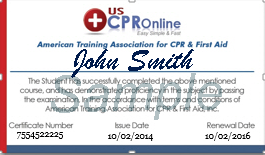 Furthermore this section goes in detail about each type of CPR’s protocols. It also discusses in detail compression only CPR protocol, which was recently put out by the American Heart Association. Conscious and Unconscious Choking: This section highlights conscious and unconscious choking in adult victims and the treatment for it. It further explains chocking in infant and child victims and their respective treatment protocols. Automated External Defibrillator (AED): This section explains AEDs and how to best use them while resuscitating a victim.